Every year at Mobile World Congress we see many OEM coming out with their flagship handset. Samsung on day 1 itself holds UnPacked event to announce flurry of devices. This year at MWC we saw the Korean smartphone giant introducing the seventh generation of their flagship Galaxy S Series. 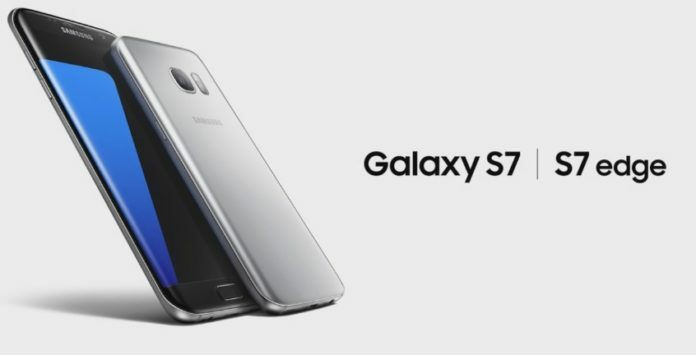 Known to all as the Galaxy S7, it’s packed with bunch of new features and through this article we will be showing you some of the Samsung Galaxy S7 Tips and tricks which you can play with. Make sure that these tips do work for the Samsung Galaxy S7 Edge as well, so don’t be afraid to try them. So to cover up all the Samsung Galaxy S7 tricks, we are going through FAQs kind of questions, for them the answers are provided below. These are the questions not relating to when the smartphone will be available, what will be the price, etc., these are simple question that every consumer after purchasing a smartphone asks. 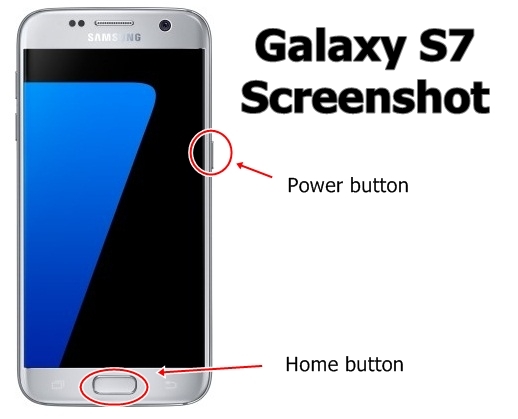 How to Take Screenshot on Galaxy S7? How to Check for IMEI Number on Galaxy S7 or Galaxy S7 Edge? What is Find My Mobile feature on Galaxy S7 and Galaxy S7 Edge? What are the Changes in the Gallery App? Can I Connect Galaxy S7 to My Car for Apps access? How to Project Galaxy S7 Photos and Videos on TV? You should open the page for which you need to take screenshot. You need to press and hold Power button and Home button together for two seconds. You will hear flashy animation on your device. If you hear that, it confirms that you have successfully take screenshot on your device. It’s accessible from Notification panel and it’s saved in a folder under Gallery > Screenshots. Palm Swipe Method – Just swipe the edge of your hand across it from side to side in contact with the screen. Open your device and go to Dialer. Now from dialer, dial *#06# and press Enter or Call. In reply you will get the IMEI number of your device. On the Box : All OEM usually write IMEI number of the handset on the box. So if you have forgot to note down IMEI number, get your Galaxy S7 box and IMEI number will be written on it. On Invoice/Bill : Many seller write IMEI number of the device on bill. If you have one you can easily find out. Over a time your smartphone becomes slow with so many prefetched items, settings and apps. There are always advantages of factory Resetting your smartphone and if you are looking for Galaxy S7 factory reset, then we have mentioned it here. 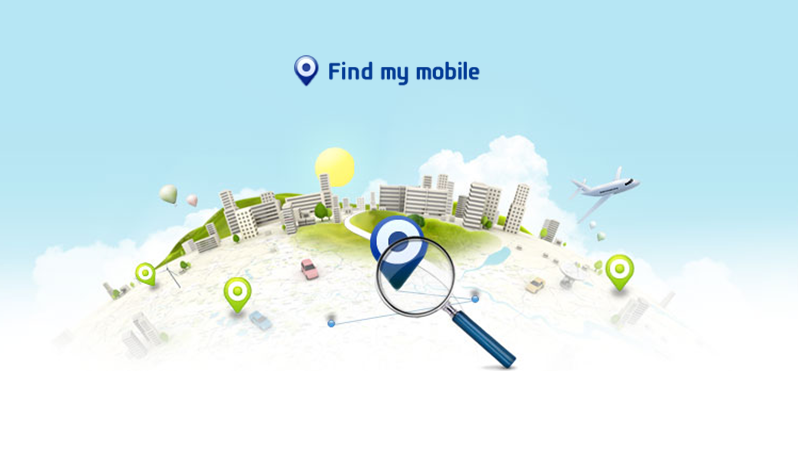 The recent breed of Samsung phone includes Find My Mobile as one of the pre-installed apps that comes with TouchWiz. The app helps you to locate your device when stolen or missed and you can also protect your personal information from being seen by intruders. Importing features of what people have liked of Gallery App from Galaxy S6, the successor has done it with Android 6.0 Marshmallow on it. It’s more clean and precise and you can now directly go to Camera from the Gallery app itself. Further you can now search/list down images based on time, categories and tags. Now that’s a great addition. How to Connect Galaxy S7 to Car using MirrorLink? 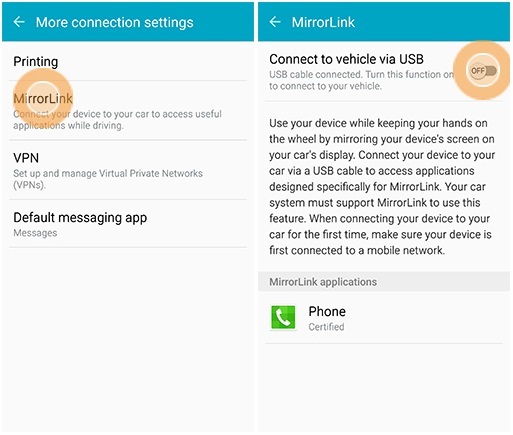 Using the MirrorLink feature the Samsung Galaxy S7 Edge and Galaxy S7 owners can now easily connect their device to Car/Vehicle. You can interact with apps on your device and to do that just follow the process mentioned below. Connect Galaxy S7 to USB port of your Vehicle. Go to Settings > More > More Connection Settings and touch on MirrorLink. Now tap on ‘Connect to Vehicle using USB via USB‘ to enable feature. That’s not a big problem, because Samsung phones are now powered with Screen Mirroring option which was previously known as AllShare. You can easily display photos on your Galaxy S7 Edge or Galaxy S7 wireless on any HD TV. 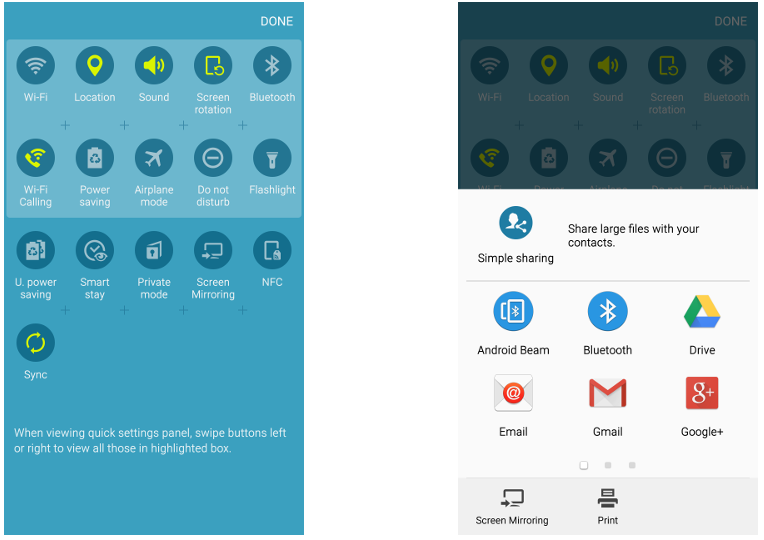 You can access Screen Mirroring option directly from the Notification Panel or you will get it during the the sharing menu. 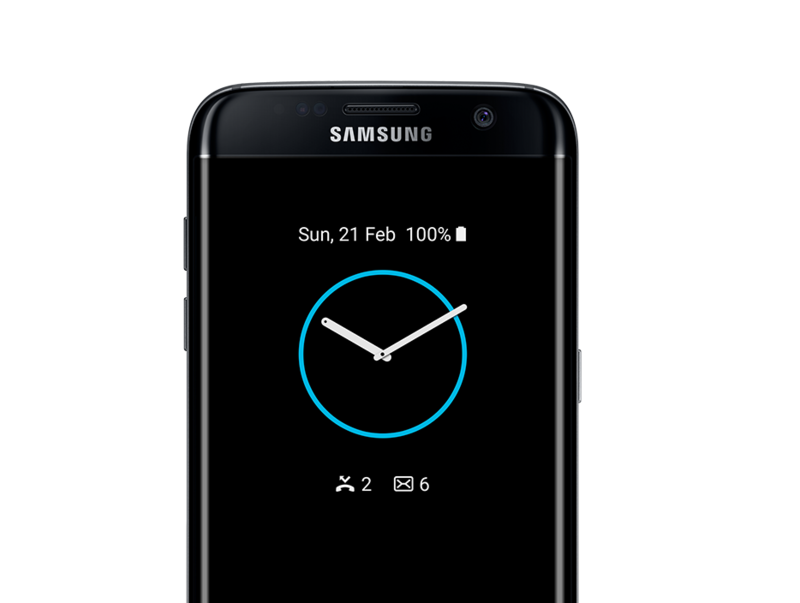 How to Customize Samsung Galaxy S7 Always ON Display? Samsung’s newest feature moving on from Galaxy S6 is the all new ‘Always ON display‘. Gone are the ways when we used to remove our phone, unlock it to check for notifications, even to access lock-screen we required that to do it. 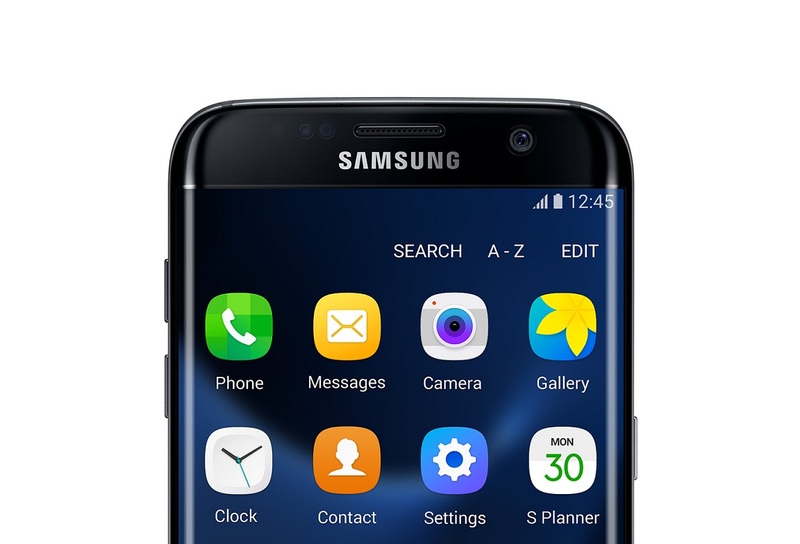 The Galaxy S7 Edge Always ON Display will give you key stats of your phone like the time, battery left, date information on always-On display. Now you can ask me whether its at the expense of battery life? No, not at all, Samsung says that it will not even use 1% of your battery life per hour. Further S7 has 3000 mAh battery which means no worry at all. You can even disable it as well to save battery further. 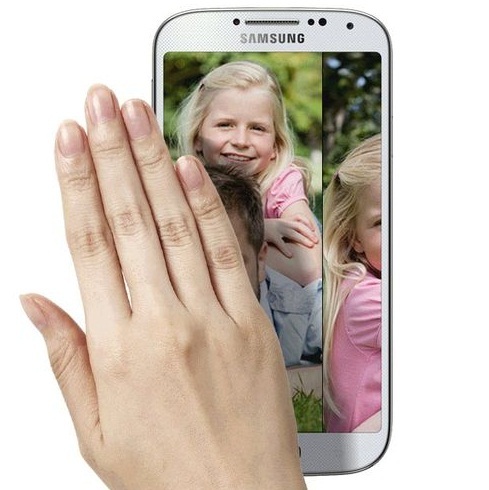 Download Mode is only for Samsung smartphones through which you can flash stock firmware files. First Power off the device completely. Press and hold the Power button + Home Button and Volume Down button together for few seconds. You will be “Warning…” message on your device. Now Press Volume Up button to confirm the action. Your device display will show “Downloading.. .Don’t Turn Off the Target“. That’s it. It’s time to connect your phone to PC. Press and hold the Power button + Home button + Volume Up button together for 3-4 seconds. If you were successful, you will be asked to Press Volume Up button again, do it. That’s it! You are into recovery mode. This video might be helpful to you. From App drawer, open Settings. Now go to Language and Input. 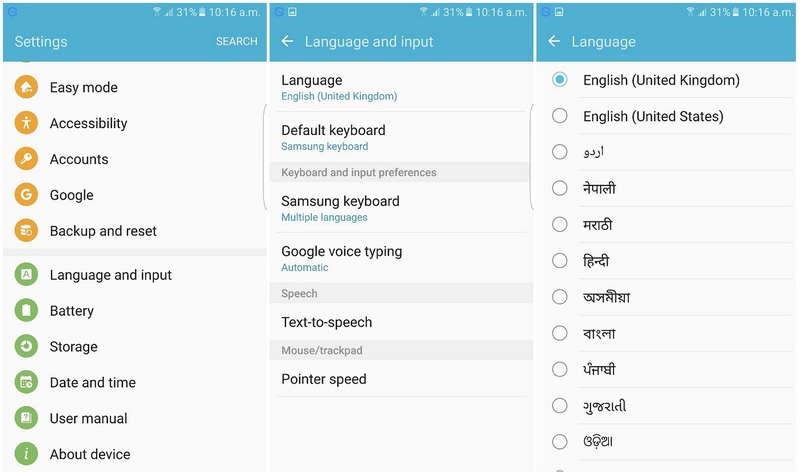 Here you will have all the options to change the language, default keyboard, keyboard languages. 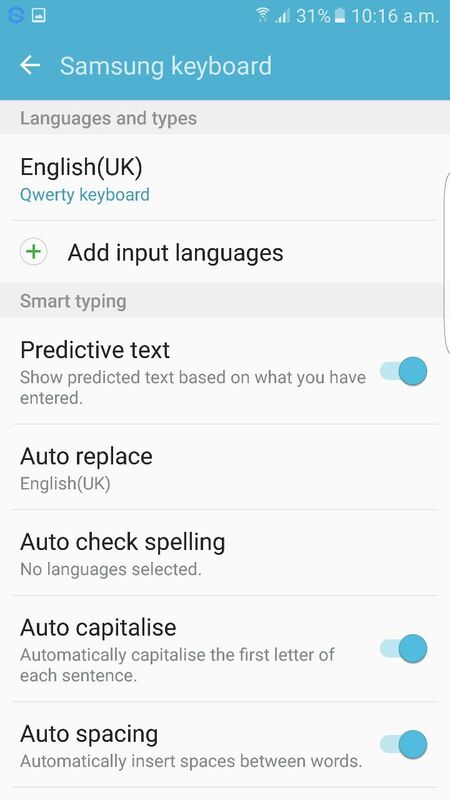 To add multiple languages to the Samsung keyboard, you just need to tap on Samsung Keyboard and then select Add input languages. Then you will get multiple languages where in you can type on your device. So that was our definitive guide on Galaxy S7. I hope most of the things are covered. If you have any particular questions then do ask us.